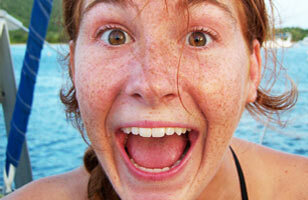 SeaTrek's summer camps for teens are set in the tropical waters of the Caribbean and the British Virgin Islands. 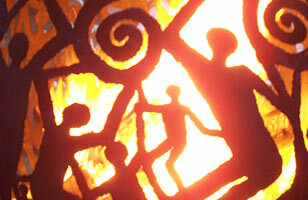 Our voyages offer unmatched opportunities for adventure and personal growth. Students are immersed in hands-on sailing, scuba, and marine science instruction. 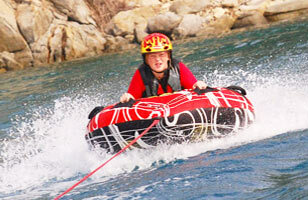 Combined with water sports, hiking, kayaking and shore excursions, SeaTrek students enjoy the adventure of a lifetime. It's fun; it's educational, but fundamentally it's a great adventure. I would recommend SeaTrek to anyone looking for a real growth experience for their children. SeaTrek is dedicated to staying small and personal. Our 3:1 student to staff ratio allows us to tailor the SeaTrek teen adventure camps to each student. SeaTrek students gain knowledge and skills in all aspects of our program, but they can also focus their time on the activities that most interest them. The options for fun, adventure and learning are endless! Our students are engaged in all aspects of boat life – from skippering and sailing to meal prep and boat maintenance. SeaTrek students leave our summer programs with a wealth of yachting knowledge, but also leadership skills and feeling more empowered and confident. SeaTrek has helped me become independent and confident in so many things like sailing, diving, and living on a boat with others! We keep our class sizes small, limit the number of boats, and provide excellent supervision by our experienced staff. Our students and staff form unbelievable bonds as they work, live, sail and dive together, creating a home-away-from-home atmosphere out on the water. SeaTrek has 100% without a doubt changed my life in a sense of goals and aspirations! I've met a family away from home that I know will be in my life for years to come! Each SeaTrek teen summer camp boat is separated by student age and staffed by a captain, marine biologist, NAUI scuba instructor, and deckhand/divemaster to provide adequate supervision, accessibility and expertise. 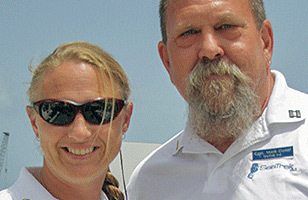 All staff are Rescue Diver and CPR/1st Aid certified with many being instructors. Safety is our #1 priority. We understand the inherent risk involved in sailing, diving and exploring so we adhere to a very strict code of standards and procedures and hold our staff to the highest standards possible. All staff-student interactions are centered on a system of values that include responsibility, trustworthiness, caring and respect. 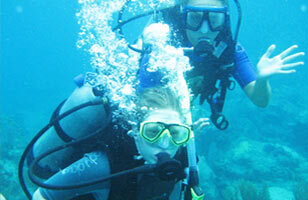 Our scuba camp and sailing and marine biology instruction are second to none. We use a student-centered teaching method that encourages students to build confidence and go beyond the required skill sets. Students serve as skipper of the day, assist our marine biologists, and earn diving and sailing certifications. Our sailing catamarans serve as floating marine science classrooms. 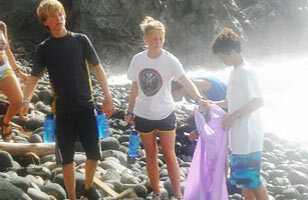 Our staff biologists introduce students to the ecology and wildlife of the islands. Our summer marine biology program provides a variety of interactive, hands-on marine biology activities. 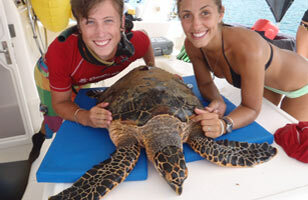 These include sea turtle tagging, coral reef surveying, species monitoring, and reef fish identification. By participating in these marine biology projects, students can earn community service or academic credit. It was really interesting to learn about something and then go there and learn about it by seeing it for yourself. No matter how hard we’ve been working during our dive classes or yachting, we always make time for fun. We roll out the water sports boats and water toys daily – kayaks, knee boards, wake boards, tubes and stand up paddle boards. Students enjoy hiking through tropical forests, exploring intertidal areas, learning about island culture and playing beach games. Both Captain Monk and Kat have had a profound influence on Colin. Their philosophy, passion and way of teaching will stay with Colin throughout this life. Most of our students have never been sailing or scuba diving before. Our staff is the best in the industry, having years of experience teaching and guiding students all over the world. At SeaTrek our students learn more about the world and themselves than they ever dreamed possible. 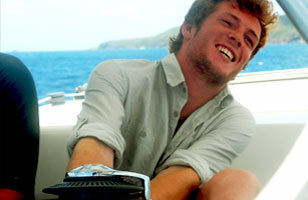 Join SeaTrek BVI’s at sea summer camp for teens and embark on the adventure of a lifetime! SeaTrek has been an invaluable and irreplaceable experience for my children, and has significantly shaped their childhoods. The post Staff Spotlight: Aidan Parker appeared first on SeaTrek BVI. The post Staff Spotlight: Ray Ball appeared first on SeaTrek BVI. The post Open water, Diver Master and Beyond: How SeaTrek shaped my life appeared first on SeaTrek BVI.